Tour the perfectly preserved Victorian town of Matjiesfontein with renowned author Dean Allen. Starting at the majestic Lord Milner Hotel, you'll be guided down the high street, through the immaculate gardens, and along the train station, ending up at The Laird's Arms for a well-deserved pint. Over the course of the walk, Dean will tell the tale of the village's creation by the 'ideal colonialist', James Logan, in the late 1800s. You will follow Logan's transformation from a penniless 19-year-old Scottish immigrant to the man who built a model town in the middle of nowhere, influenced trade and politics, and toured Britain with his very own South African cricket team. The tour begins outside The Lord Milner Hotel on Matjiesfontein's main road, in the picturesque front courtyard. The walk can be done at any time, but the gardens are particularly beautiful in the morning. You might like to start this tour around 4:30pm, to arrive at the Laird's Arms in time to take "the world's shortest bus tour", which leaves from right in front of the pub. If there has been heavy rain, the river crossing may be flooded. Please check this with the hotel's front desk before starting the tour. The gardens are also known to have a few resident snakes, so keep your eyes open and be aware along this section. What a fun way to discover that there is more to Matjiesfontein than just the main road! 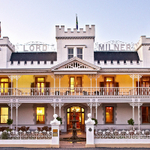 Our 10 year old son loved it (he's a cricket fanatic which helped for sure) and we will definitely be back to spend a weekend at the gorgeous-looking Lord Milner Hotel.